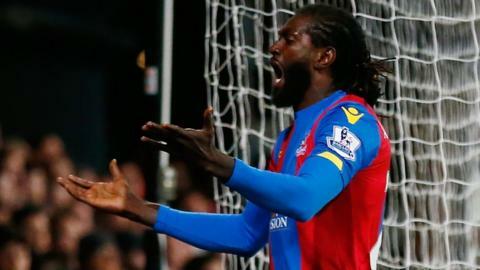 Emmanuel Adebayor is fully committed to Togo, says coach Claude LeRoy. The 30-year-old has quit Togo twice and often criticised the set-up but LeRoy is sure the striker is now happy. "He wanted to retire but he told me that as soon as he heard I was coming to coach Togo he changed his mind," LeRoy revealed to BBC Sport. "I told him that I see him as a perfect captain and an example for all the players to try and build something strong for the next few years." Now playing his club football at English Premier League side Crystal Palace, Adebayor ended a self-imposed international exile to return for Togo in March in the 0-0 draw with Tunisia in an Africa Cup of Nations qualifier. It was his first appearance for the national team since June and a significant U-turn following his decision to reject a call-up for their previous game. And LeRoy, who was appointed coach on 5 April, has moved quickly to ensure Adebayor will remain part of the squad and give the team the best chance of success. "He's very happy and we had a very beautiful discussion together. I think for the next camp he will be the first at the training camp, I'm sure about that," added LeRoy. "I had a very strong relationship with him for a long, long time - before I ever knew that one day I'd be in charge of Togo. "I consider him a top player and he has to prove to me on the field that he's a top player." Frenchman LeRoy has admitted that Togo face a tough task to make it to Gabon but he believes the tournament does not represent Adebayor's last chance to shine in the big stage. "I was telling him that when I became coach of Cameroon, Roger Milla was 35 and nine years later Roger was playing in the World Cup in the United States," LeRoy said. "I told Emmanuel that he may not play on for another nine years, but maybe he can for two, three or four years. "And if he makes a lot of sacrifices it's possible for him to stay, or to come back, at the highest level."